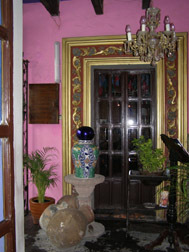 The restaurant Sacristia de la Compañía is located in the tiny 8-room luxury boutique antiques-filled hotel Mesón Sacristía de la Compañía which was once an 18th century mansion in Puebla, Mexico. The restaurant is visual eye candy with its traditional brightly colored walls and interesting objects, and the food is excellent. I had lunch at Sacristía de la Compañía in late October 2009 after taking a 1-day cooking class on the premises with their acclaimed chef, Alonso Hernández, where I learned the culinary art of making Cocina Poblana, the famous cuisine of the Puebla region. After my cooking lesson where my appetite was stimulated by delicious aromas, I was more than ready to have lunch. Sitting in the colorful brightly dining room that was painted blue, violet, and rosa Mexican the intense and cheerful pink of the region while waiting for my food to arrive, I had time to appreciate all the nuances of the room, namely the plentitude of antiques from the large wood sideboard to the smaller items that lined the walls, all of which are for sale. Everywhere I looked there were interesting objects that included furniture, chandeliers, statues, china and crystal, as well as decorative objects that were subtly arranged and showcased. The owners of the property are third generation antiques dealers and they decided that it would be a wonderful idea to combine their antiques gallery with a small hotel and restaurant, and the result is fascinating. I sat a wood table set with hand-blown glass goblets rimmed with cobalt and wood placements with attractive blue and white talavera charger plates and enjoyed listening to the piano music, which was the perfect accompaniment as I took in my attractive surroundings. 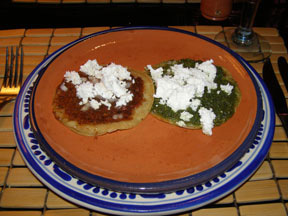 My lunch began with tasty appetizers of chalupas, which I had learned to make earlier in my class at the cooking school, presented on a terracotta colored plate set on a charger plate of blue and white talavera. The appetizer consisted of two tiny corn tortillas, one topped with Salsa Verde (green sauce) made from tomatillos, onions, serrano chile, garlic, and cilantro, and garnished with shredded cheese, and the other one topped with Salsa Roja (red sauce) made with tomatoes, onions, chipolte chile, and garlic, and garnished with shredded cheese. Paired with traditional Jamaica Agua Fresca, (hibiscus flower water) made from dried hibiscus flowers, sugar, water, and ice, it was a lovely way to begin. 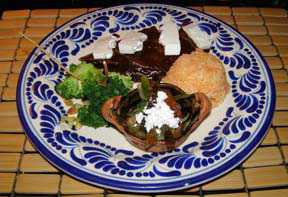 I continued with mole, which I had also learned to make in my cooking class and is the most famous of the Cocina Poblana dishes, however instead of having the more traditional mole poblano that is served over chicken or turkey, I had a delicious mole enchilada topped with cheese that was accompanied by steamed broccoli with sliced almonds, a mound of seasoned yellow rice, and a small clay pot filled with julienne chiles, onions, and topped with cheese, which was the perfect ending to my Cocina Poblana experience. Sacristía de la Compañía is open for lunch and dinner Monday through Saturday from 1:30 pm until 11:30 pm, and on Sunday from 1:30 pm until 5:30 pm. There is live piano music on Friday and Saturday from 9:00 pm until 11:45 pm. Read about the Cooking Class at Sacristía de la Compañía in the Gastronomy section: Cocina Poblana Cooking Class at Sacristia de la Compania, Puebla, Mexico. Read Chefs' Recipes where Chef Alonso Hernández graciously shares his recipe for Mole Poblana: Chef Alonso Hernandez Recipes - Sacristia de la Compania, Puebla, Mexico. Please read other articles on Puebla, Mexico in the Destinations, Hotels and Resorts, Restaurants, Chefs' Recipes, Gastronomy - Cocina Poblana Cooking Class at Sacristia de la Compania, Puebla, Mexico, and Arts sections. Read other articles on Mexico in the Destinations section: Riviera Maya, Mexico and Ixtapa-Zuahuatenjo, Mexico; in the Adventures section: Adventures: Maya Zip Lines - Flying High in Riviera Maya, Rio Secreto - Exploring the Riviera Maya Cenotes, Riding ATVs in Iztapa-Zuatenejo, Biking, Kayaking, and Snorkeling in Ixtapa-Zuatenejo, Swimming with Dolphins in Iztapa-Zuatenejo, in the Hotels and Resorts section, in the Spas section, in the Restaurants section, in the Chefs' Recipes section, in the Liquor Cabinet - Scorpion Mezcal, and in the Music Scene section: Paco Renteria Interview and Paco Renteria - Gitanus and Oceano. 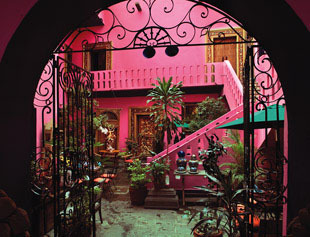 For information on Puebla, Mexico, please visit the website: www.VisitMexico. For information on Mexicana Airlines, please visit the website: www.Mexicana.com or call them at 1-800-531-7921. © November 2009. Luxury Experience. www.LuxuryExperience.com All rights reserved.